In spite of my lifelong exposure to Mexican food, I haven’t eaten posole (a.k.a., pozole) before. I love dishes made from masa (tamales! ), and the lime-treated corn kernels which get ground into masa flour are also referred to as posole or hominy. The motivation for this recipe comes from Deborah Madison’s Posole with Red Chile Pods, in Vegetarian Cooking for Everyone . The result is somewhere between a light chile-stew and a rich, flavorful soup. My version has additional spices and the option to add stock. The dish is easily made vegan if not made with animal-based stock or garnishes. Another realization with this dish is that you can have a lot creativity with the garnishes. In fact, if you make the vegetarian version, the garnishes you (and/or your guests) make available would suit a huge ranges of tastes and tolerances. It’s fun to assemble! Update, 23 June 2013: My tastes for this dish has changed over the years, so I’ve modified things. The oregano (Mexican or otherwise) seems to give this a musty flavor I don’t like. I’ve already reduced the amount of chilis (feel free to keep it high, if your tastebuds allow! ), increased the cumin and coriander, added cinnamon, and added tomatoes while cooking. 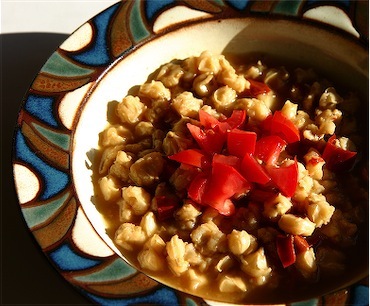 You can use dried posole of any color; I’ve used white kernels for this article. Try to find Mexican oregano (available at Mexican grocery stores) if you can. Regular Italian oregano could be substituted, but Mexican oregano has a unique flavor which is gentler and subtler than Italian oregano —a much better complement to the mellow flavor of the corn and the spiciness of the chiles. 2 to 4 dried guajillo chiles, chopped into strips; also use the seeds, but discard the stems. (optional) 1 to 2 teaspoons Mexican oregano; use less if dried, more if fresh. shredded cheese: Monterey Jack, queso fresco, cotija, feta, etc. Soak the posole overnight. Drain off water when ready to cook. In a large stock pot, sauté the onions in the olive oil until translucent. Stir in the garlic, chiles, bay leaf, ground cumin, coriander, and cinnamon stick. When the mixture becomes pungently fragrant, stir in the water (or stock) and tomatoes, and bring to a gentle boil. Simmer until the posole kernels have popped open and become tender. The amount of time could vary quite a bit, depending on the brand and quality of the corn kernels, between 2 to over 5 hours! Periodically nibble a kernel or two to test for doneness. Add more water if it seems too thick. Again, when most of the kernels have popped (like popcorn in liquid, literally), it should be ready. About midway into the simmering, add 1 to 2 teaspoons of salt (depending on the saltiness of the stock, if used). If the flavors seem too strong, feel free to remove some of the chiles or the cinnamon stick. About an hour so before serving, add the Mexican oregano to the posole. I tend to throw in a small bunch tied into a small bundle; because its flavor can be strong, I often remove the oregano bundle right before serving. When serving, add more salt if desired, and some freshly ground pepper. Garnish to your heart’s content. Leftovers can be stored in the freezer. This was written by sairuh. Posted on Monday, September 10, 2007, at 10:54 am. Filed under Food. Tagged casseroles, chiles, Mexican, soup, stews. Bookmark the permalink. Follow comments here with the RSS feed. Post a comment or leave a trackback.